The Men's Room Thanks Miami, We Learned a Lot! News	2 Comments on Thanks Miami, We Learned a Lot! I’ve been running TheMensRoom.com for over 7 years and I’ve never, ever been this transparent. However, seeing that sharing experiences (i.e. men’s grooming advice) can always help others, I saw this as just one more opportunity…so here goes! After spending 10 years in Los Angeles, my wife and I (after a great deal of thought and planning), decided that is was time to move back home to So. 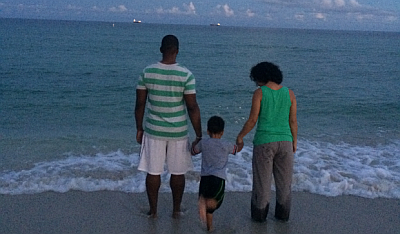 Florida with our 4yr old son- Isaac. It was a move focused on being closer to parents for family support, more affordable living and career expansion. We sold and gave away all of our material goods and jumped feet-first into our decision to have a better work/life balance. But, as much as I’d love to say that this was a happy ending decision, it was far from it. This move proved to be an extremely challenging experience. Everyday seemed to be a difficult test: emotionally, spiritually and even financially. My wife and I questioned our move back every minute of every day. And, the icing on the cake was that our son was struggling with his new preschool experience that was sadly far from his Reggio Emilia-inspired one in California. Then, after 6 months of fighting the difficult “swim up-stream” we gave in and just surrendered. We stopped fighting and started to embrace the tough moments. We began recognizing that the support of our families and new friends came in many welcoming forms. We began to see that the reason we moved back to Florida wasn’t for what “we” wanted. It was to take a break (for however long) from the very noisy & busy grinding life we lived in Los Angeles for the last 10yrs. It was for me to put my career in proper perspective and in it’s rightful place- after God and family. It was to re-connect to our parents in a more loving and adult way. And finally, it was for Isaac to get to know, feel and experience his grandparents and great-grandparents more. You see, “our” plan was never “ours” to begin with. We realized that it was bigger than “us”. It was time designated for us to PAUSE and take a step back in a way that only happens when you UN-PLUG. For 11 months we lived in Miami, FL. We lived there long enough to experience everything we needed to re-balance our lives and re-purpose our purpose. Every day of those 11 months was divinely orchestrated even down to me recognizing that my career expansion was not for Miami. And, you know what? I can say confidently that we made it through these tough times, better than when we started. You see, too often we are afraid to try something different for the fear that things won’t work out. But in actuality, even when it feels like it hasn’t, it really has! It’s because, in every challenge there is an opportunity to grow wiser through the experiences. For us, we gained a new perspective on life and what’s truly important in the long run. And as far as the 11 months go, it’s was truly an unforgettable experience packaged in a very short span of time in light of our overall life experience. So, be encouraged; do the thing that scares you…you’ll be the better for it! Wow Craig and Lisa. I REALLY needed to hear this at this moment in my life…FOR REAL. You both have made some very bold decisions that most of us would never make. Looking in from the outside, I have seen the sacrifices that you two have made and just know that God will honor it. Faith honors God and God honors faith. Be blessed you two! Love you guys. What a humbling experience the 3 of you had. At least you went thru it and saw the good of it. Are you 3 back in California?